In order to research your ancestors, it is imperative to know local history! And although family researchers treasure our museum docents and local tour guides, don't rely on them for your historical research. Do a bit more digging to uncover the full story. A walking tour of Old Town Albuquerque, today, highlighted the fact that misinformation may be given. Mr. Tour Guide, "Hispanics are not small and petite"; and "Latinos are not larger and more stout!" This is 2011 and we have been submerged in an era of politically correct. The best answer of the two terms - hispanics and latinos - could not possibly be based on physical characteristics. Carlos Fuentes explains the cultural use of the two terms (along with chicano) in the early chapters of The Buried Mirror - The Reflections on Spain and the New World. 2) Albuquerque EVEN had Christian Hispanics who mimicked the Jewish traditions of 1) "not eating pork" 2) "lighting a candle on Friday." Mimicked? Mr. Tour Guide, the discovery of Sephardic Jews in Spanish settlements such as Albuquerque and in the state of New Mexico is well documented. "Conversos" also settled in Texas, Arizona, Colorado and California. Perhaps a quick read on the New Mexico Conversos would illuminate secrets of your ancestors. You may wish to read articles on the crypto-Jews, or hidden Jews of the southwestern United States who began fleeing Spain more than 500 years ago. Their contribution to the settlements of the Southwest is well documented - see the Crypto Jews of New Mexico in To The End of the Earth by Stanley M. Hordes. For more information visit the New Mexico Jewish Historical Society. 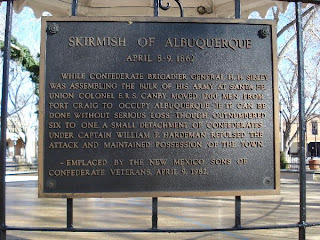 3) There was not a presence of the Sons of the Confederates and other Confederate organizations in Albuquerque. Attention to Detail? Mr. Tour Guide, you must be kidding? Why not begin by looking at the plaques standing in the middle of Albuquerque Old Town Plaza. General Henry H. Sibley and Texas volunteers occupied Old Town Albuquerque in 1862. The Confederate flag still sways prominently in the Plaza. And, the New Mexico Sons of the Confederate Veterans honored their soldiers with a plaque in April 1982. There are documents galore on Confederacy pre and post Civil war activities. Local tours are of interest and quite valuable to the family researcher. But, do your homework to verify facts and to uncover the truths. The bonus is the possibility of finding your ensconced ancestor in the records.